Situation - The Texas sun blazed above Mandy Rhodes’ west-facing home—leaving her tall windows, furniture and family unprotected from heat, glare and UV rays. Rather than sacrifice her stunning lakeside view to curtains or shutters, Mandy and her family endured the summer heat. But as the air conditioner ran, and the family portrait above the fireplace began to fade, Mandy turned to LLumar® window film. 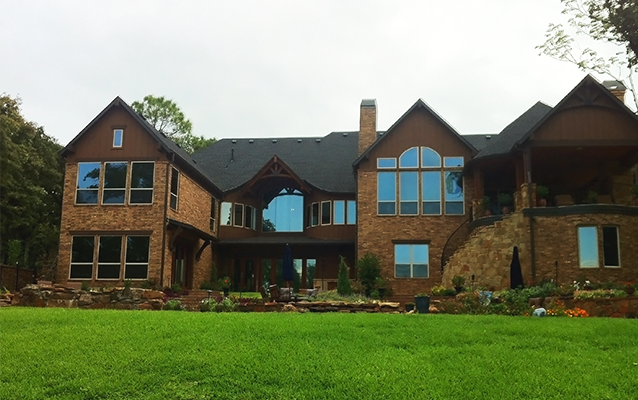 Solution - LLumar dealer Ron Boully, of Lone Star Window Tinting, recommended LLumar DR-15 and DR-35 window film for her windows. He provided Mandy with samples so she could see how LLumar helps guard against glare, heat and harmful UV rays. Despite the obvious benefits, Mandy had reservations, but she gave Ron the go-ahead, and the installation was complete in under a week. “I was concerned about making it too dark inside. But once it’s on, you don’t even notice it—though you’re glad it’s there,” she says. The Texas sun had met its match. Result - Today, Mandy’s family enjoys the view from every angle—the glistening lake beyond the backyard and glare-free television and computers inside. Plus, her family portrait, floors and furnishings are protected from the harmful UV rays that can cause fading. LLumar window film helps keep Mandy’s family comfortable—and helps protect her memories—so she can focus on making more.